At Hamilton, our goal is to bring you the latest in Internet technology and provide helpful information and answers to your Internet service questions. 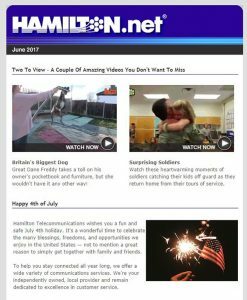 It is in this light that we are pleased to provide a monthly e-Newsletter for all Hamilton.net subscribers. You can look forward to receiving helpful and timely information geared to enhance your experience and broaden your understanding of the Internet. Please be assured that our e-Newsletter is an authentic virus-free communication sent to you from Hamilton.net. Generally, we recommend not to open or unsubscribe to unsolicited e-mails. That rule still holds true. And while we think you will really find the content of value, if you do choose to unsubscribe, please also feel comfortable to click on the unsubscribe link within our e-newsletter. If you have any questions, we’re only a phone call or e-mail away and are here to serve your Internet service needs!